Every once in a great while, a book comes out that is a standout in its field. One that is well written, that teaches, educates, and leaves the reader thinking for days afterwards about its subject. One that challenges the reader to overcome biases and misconceptions. And recently, such a book was published. The book? 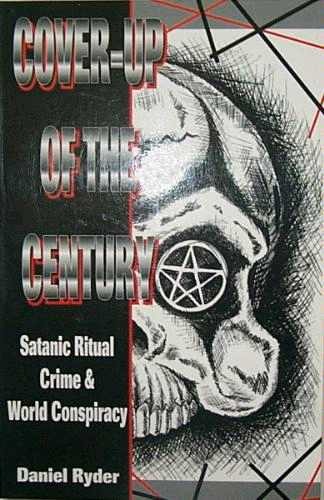 "Cover up of the Century: Satanic Ritual Crime and World Conspiracy" by Daniel Ryder. If you don’t have a copy yet, I suggest you go to your local bookstore, or Amazon.com online, and get one. This is one of the better researched and documented books on the topic of ritual abuse that I have seen. Mr. Ryder meticulously documents the evidence with research and in-depth interviews throughout his book. From government officials to police investigators, survivors of occult ceremonies to concerned parents, psychologists to lawyers, his extensive research and fact finding combine in this book to draw a compelling picture: ritual abuse is real, it is happening, and it is organized. He refutes statements by Lanning of the FBI that ritual abuse has no evidence with literal archives of cases of ritual abuse that have gone to court and been successfully prosecuted. I love the first chapter which asks "Where's the Proof?" then proceeds to answer the question. Studies are quoted, officials discussed and documented cases of ritual crime are given. Ryder's background research on some of the leading members of the False Memory Syndrome Foundation (FMSF) is a thought-provoking chapter, as the "syndrome" is exposed as having no reality according to clinical experts in the field. Also, the less than savory background of some of the founding members and "experts" recruited by the FMSF are revealed.